The Tramex hygrometer is calibrated to 75%RH at 20°C. It is designed to remain calibrated for 18 months from the date of manufacture. Tramex Hygrohood has a measuring range of 20%RH - 99%RH, with a temperature range of 0°C - 50°C (Tolerances +/- 3%, +/- 1°C). What is the Hygrohood used for? 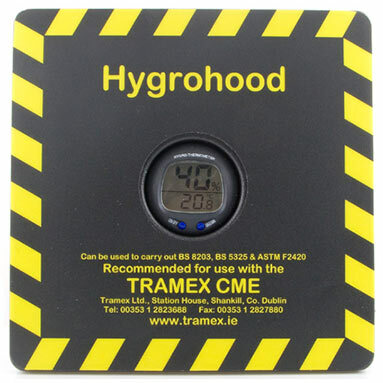 The Tramex Hygrohood is an insulated humidity hood with built-in hygrometer, used for non-destructive relative humidity testing of concrete and other floors and screeds to international standards. How do I use the Hygrohood? For full details of how and when to use this product - Please view the Hygrohood PDF brochure! When should I turn the Hygrohood on to start testing? As soon as the equilibrium has been reached it can be turned on. How long should it be on the floor for, before taking a reading? The answer is 24 to 72 hours, depending on environmental conditions. It depends on how bad the surface is, and if you will be on site all the time. If there is any artificial heating or drying equipment then the advice is to turn these off at least 96 hours before the final readings are attempted, otherwise the readings won't be accurate. Will the Hygrohood record the values when it is on? It will record the minimum and maximum values while it is switched on, however the memory will be reset when the unit is switched off. Can additional tape be purchased to secure the Hygrohood in place? Yes, additional tape can be purchased from us. However the product is not on our website. If additional tape is needed please contact our sales line on: 0114 251 3535. Yes, it is factory calibrated to 75% RH at 20°C. The calibration should remain stable for a minimum of one year from the date of purchase unless the unit is physically damaged or misused. Is this the only model that can help to test moisture content in concrete? No, we do stock two other models which are the Tramex CME4 and CMEX2. These can be used before the Hygrohood to determine the areas of greatest concern on the floor or screed. Once this has been done, the Hygrohood can then be used to test the relative humidity to corroborate the non-destructive moisture content test. What's the difference between the CME4 and the CMEX2? The CME4 has an analogue display and the CMEX2 has a digital display. Because the CMEX2 is digital, it is slightly more accurate in the measurement of the moisture content in concrete, but only by .9%. Is it best to buy the hand held moisture meter as well as the Hygrohood? If the floor or screed is quite bad or you are unsure how bad it will be then it is advised to purchase both in order to know which areas are the worst affected. You would then able to get a more of an accurate reading. However, if it is just for one building/job then you could operate with just the moisture meter or just the Hygrohood. What is the warranty on these models? The warranty for all three of these models is one year. If you require advice on the product outside of the warranty period, then we'll be happy to arrange a call with a Tramex technician to see if they can help you.